Diamond Home Service is committed to providing quality service and craftsmanship at reasonable prices in every aspect of home remodeling. We provide clean, custom-crafted windows that allow you to clean both sides of the window from inside your home. Our siding is made of durable vinyl construction that won't warp, peel or flake like wood, and never needs painting. Shingles offer long lasting protection against wind & rain. They also age well, maintaining their beauty after years of sun exposure. Diamond Home Service will completely remodel your bathroom in one day! We will replace your old fixtures with clean, new, sparkling ones with a $500.00 rebate! Diamond Home Service offers elbows, downspouts, gutters, miters, and many more accessories. 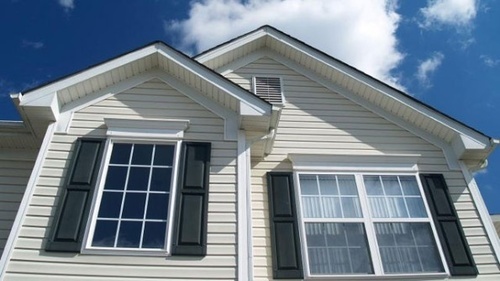 Our custom style gutters match seamlessly with your vinyl siding. Diamond Home Service offers the highest level of Reliability and Experience. We are committed to satisfying our clients from start to finish, and we promise to meet all your home improvement needs.